While a man's tuxedo alone is a relatively easy ensemble to put together, It's often the humble footwear department that lets the side down. If you're wondering what exactly you can and can't mix into your suited and booted look, read on for our complete guide on what shoes to wear with a tuxedo. Read more Men’s Style Guide features. These days, it's not often a man feels the need to don a full formal tuxedo, but, whether it's a wedding or a formal ball, every once in a while the time to dust off your formals and pull out the bowtie is required. When it comes to the tux, one of the major players you simply can't afford to get wrong is the shoes. Slip up here and the whole outfit will look out of place. Luckily there are a number of choices you can go for, so read on and try out the various ways you can look smart and stylish. Starting off as a popular hunting shoe in the 1850’s, the derby soon became a staple item for every man seeking a multifunctional shoe suited to both casual and formal affairs. Coming in an abundance of colours and materials, they feature tight lacing and a long svelte design that elongates the foot, giving it a slimline and elegant finish. The most common design to wear with a tux is a patent leather look with a rounded toe, complimenting the rest of your outfit with its clean appearance and adding some depth with its shine. 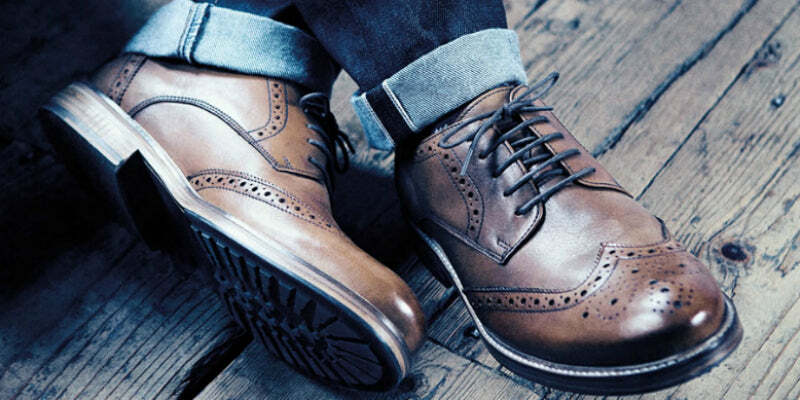 The brogue is one of those shoes that can go with almost any mixture of clothing you can throw at it, making it a worthy addition to any man's wardrobe. 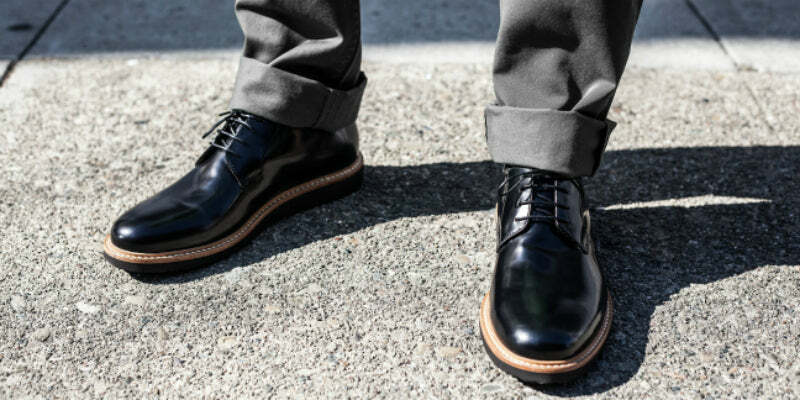 If you’re looking to keep things traditional, pick a pair of lace-up brogues in a high shine black leather. They’ll appear similar to a pair of derbies, but will have a less elongated look, keeping things a little tidier. Brogue shoes can come with intricate designs cut into the leather, but we’d recommend staying clear of this and going for a cleaner design instead when working with a tux. Black is obviously the most common colour, but you could also go with a dark brown or burgundy for something a little different. Although it’s not common in the modern man's wardrobe, the formal pump is still appreciated by the true traditionalists and continues to maintain its place in society, particularly among the opera going folk. Put simply, each pump has a silk bow in the centre that’s either flat or pinched, with the upper typically in high-shine patent leather. The subtle difference between the bow and the leather creates an interesting contrast and helps to tie it in with the tuxedo, especially if you’re wearing a traditional silk cummerbund. While we've not got any opera pumps to show you, we've chosen some more contemporary alternatives below. The Albert slipper, made famous by Prince Albert, was originally designed to be worn around the house back in the 1840s. 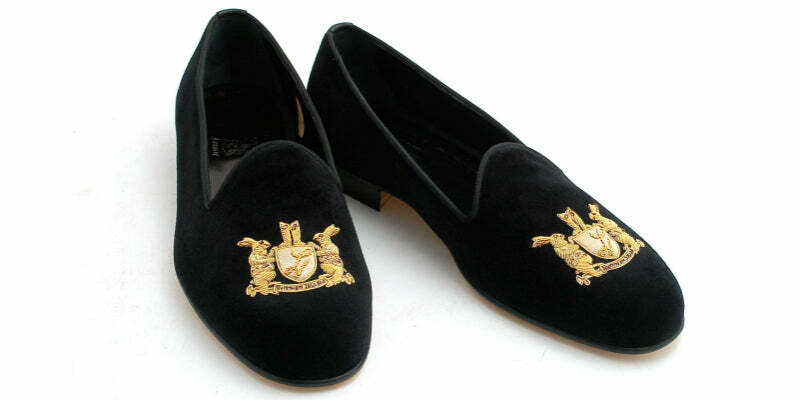 Coming in a wide range of styles and composition variations, the most common design for the Albert slipper is a black suede shoe with a gold embellishment embroidered on the foot. Despite the name, not all Albert slippers come in soft materials, and if you like the unique shape of the shoe but don’t want to look too casual, then try getting a pair in leather. As with the formal pump, the Albert slipper isn't the most common footwear style around these days so we've chosen some modern alternatives. It's surprising how many men wonder how they should be approaching the styling of their black tuxedo. If you're keeping things traditional, you can't really move far from a black tuxedo suit, black tie shoes like those above and a traditional shirt/bowtie combination. While recent years have seen some men push the boundaries in terms of colour and slight variations in style, if you're really going for the black tie look - it's best not to stray too far from the classic combination.